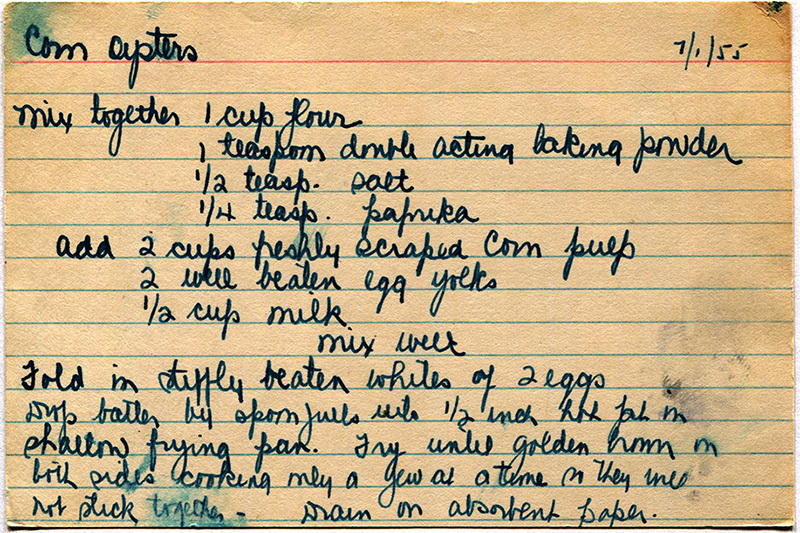 Comparing two early recipes shows two varieties of corn oyster: one like the recipe above, which is an oval-ish corn fritter, and one that’s more of a johnnycake sort of composition without leavening. Corn Oysters. — Grate the corn; to every pint take three well beaten eggs, sufficient flour to make the corn hold together in the shape of fried oysters. Season with pepper and salt, and brown on a riddle. Serve with butter. They must be made quite flat or they will not cook through thoroughly. Take six ears of boiled corn, three eggs, one and a half table-spoonsful of flour. Beat the yolks very thick; cut the corn off the cob, season it with pepper and salt; mix it with the yolks, and add the flour. Whisk the whites to a stiff froth, stir them in with the corn and yolks; put a dessert-spoonful at a time in a pan of hot butter, and fry to a light brown on both sides. From a box sold in Warren, Michigan. Click here to see the card in full size. This box was a birthday gift to AdGo from Julie at Covetpaper.com. Thanks Mmbe! Fold in stiffly beaten whites of 2 eggs. Drop batter by spoonfuls onto 1/2 inch hot fat in shallow frying pan. Fry until golden on both sides, cooking only a few at a time so they will not stick together. Drain on absorbent paper. From a box sold in Warren, Michigan. When describing baking powder, this means the chemicals trigger two rises: once when combined with moisture and again when heat is applied. Essentially all baking powders currently used in the U.S. are double-acting, but they do differ in chemical composition, how long it takes the first phase to act, and whether the bulk of the rise occurs in the oven or outside of the oven.